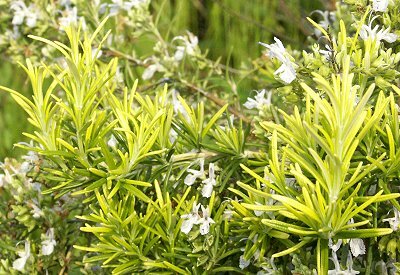 Golden Rosemary is an exceptional plant that displays bright yellow foliage in early spring and late fall. Sometimes mistakenly referred to as variegated, it is actually more like a mood ring. The leaf color varies according to the time of year. The bright yellow leaves are evident in spring and fall but become dark green with the long, warm days of summer. above). 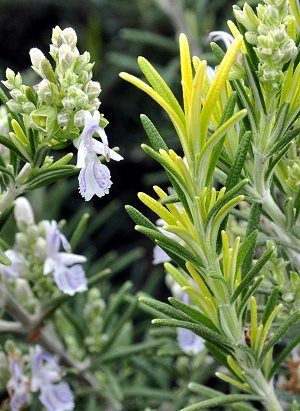 A smaller, shorter Rosemary, Golden Rosemary makes a good choice for edging the garden. 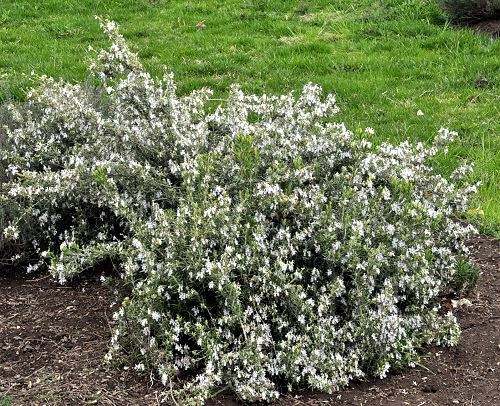 The Golden Rosemary above anchors the corner of a large garden bed where its shorter stature makes it a good edging plant. Here it is in full flower. It almost doesn't matter about the leaves at this point! This particular plant is about ten years old and about two feet tall by three feet wide. It can be used in any recipe calling for Rosemary. This plant is often available in plug trays. These trays hold 128 of all the same plant. They are a great low cost way to fill a lot of space. Each cell is 3/4 of inch by an inch. Check here to see if Golden Rain Rosemary Plug Trays are available.